The MAIA was developed to provide a comprehensive self-report measure of interoceptive awareness. Interoception has historically been recognized as a component of body awareness. Body awareness has been described as being both proprioceptive (e.g. awareness of joint angles, posture, balance, movement) and interoceptive (e.g. awareness of internal physical sensations heart rate, respiration) (Laskowski et al. Scient Princ Sports, 2000; Barrett et al. J Pers Soc Psychol, 2004). Classically, research has linked interoception with maladaptive mental states including exaggerated focus on physical sensations, rumination and catastrophizing associated with negative health outcomes including increased anxiety and pain disorders (Cioffi et al. Psychol Bull, 1991). However, with the advent of third wave cognitive behavioral therapies and increased interest in mindfulness based interventions, more adaptive conceptualizations of interoception have been proposed and interoceptive awareness has been associated with more positive health outcomes (Loucks et al. Curr Cardiol Rep, 2015; Tang et al. Nat Rev Neurosci, 2015; Hozel et al. Perspect Psychol Sci, 2011). For example, research has shown increased interoceptive awareness is linked to reductions in chronic pain, congestive heart failure, chronic renal failure, irritable bowel syndrome and reductions in anorexic eating behavior (Mehling et al. Altern Ther Health Med, 2005; Afrell et al. Scand J Caring Sci, 2007; Baas et al Cardiovasc Nurs, 2004; Christensen et al. J Consult Clin Psychol, 1996; Ericksson et al. World J Gastroenterol, 2007; Pollatos et al. Eating Behaviors, 2008). (1) Awareness of body sensations: includes awareness of negative, positive, and neutral sensations. (2) Emotional reaction and attentional response to sensations. (3) Capacity to regulate attention: various ways of controlling one’s attention as an active regulatory process. (4) Trusting body sensations & beliefs about importance of sensations: reflects the extent to which one views awareness of bodily sensations as helpful for decision making or health. (5) Mind body integration: viewed as an overarching goal of mind-body therapies. Following the establishment of these preliminary domains, a review was conducted to identify existing self-report instruments and to evaluate various conceptualizations of bodily awareness (Mehling et al. PLoS ONE, 2012). While one of the most recognized measures of interoception is the Heartbeat Detection Task, minimal research has been applied to defining a clear framework and comprehensive self-report of adaptive and maladaptive interoceptive awareness (Mehling et al. PLoS ONE, 2012. Mehling et al. Phil Trans R Soc, 2016). The results of the review indicated that no one single measure or combination of measures effectively evaluated the new framework and only two of the measures demonstrated strong psychometric properties (Mehling et al. PLoS ONE, 2009). In response to the paucity of evidence surrounding reviewed self-report measures, the MAIA was developed. Text Citation: Laskowski ERea (2000) Proprioception. Scient Princ Sports Rehab 11: 323–340. Text Citation: Barrett LF, Quigley KS, Bliss-Moreau E, Aronson KR (2004) Interoceptive sensitivity and self-reports of emotional experience. J Pers Soc Psychol 87: 684–697. Text Citation: Cioffi D (1991) Beyond attentional strategies: cognitive-perceptual model of somatic interpretation. Psychol Bull 109: 25–41. Text Citation: Loucks EB, Schuman-Olivier Z, Britton WB, et al. Mindfulness and Cardiovascular Disease Risk: State of the Evidence, Plausible Mechanisms, and Theoretical Framework. Curr Cardiol Rep. 2015;17(12):112. Text Citation: Tang YY, Holzel BK, Posner MI. The neuroscience of mindfulness meditation. Nat Rev Neurosci. 2015;16(4):213-225. Text Citation: Holzel BK, Lazar SW, Gard T, Schuman-Olivier Z, Vago DR, Ott U. How does mindfulness meditation work? Proposing mechanisms of action from a conceptual and neural perspective. Perspect Psychol Sci. 2011;6(6):537-559.http://doi.org/10.3389/fpsyg.2015.00120. Text Citation: Mehling WE, et al: Randomized, controlled trial of breath therapy for patients with chronic low-back pain. Altern Ther Health Med 2005, 11(4):44-52. Text Citation: Afrell M, Biguet G, Rudebeck CE: Living with a body in pain – between acceptance and denial. Scand J Caring Sci 2007, 21(3):291-6.http://doi.org/10.3389/fpsyg.2015.00120. Text Citation: Baas LS, et al: An exploratory study of body awareness in persons with heart failure treated medically or with transplantation. Cardiovasc Nurs 2004, 19(1):32-40. Text Citation: Christensen AJ, et al: Body consciousness, illness-related impairment, and patient adherence in hemodialysis. J Consult Clin Psychol 1996, 64(1):147-52. Text Citation: Eriksson EM, et al: Body awareness therapy: A new strategy for relief of symptoms in irritable bowel syndrome patients. World J Gastroenterol 2007, 13(23):3206-14. Text Citation: Pollatos, O., Kurz, A. L., Albrecht, J., Schreder, T., Kleemann, A. M., Schöpf, V., … & Schandry, R. (2008). Reduced perception of bodily signals in anorexia nervosa. Eating Behaviors, 9(4), 381-388.12. Text Citation: Mehling WE, Gopisetty V, Daubenmier J, Price CJ, Hecht FM, et al. (2009) Body Awareness: Construct and Self-Report Measures. PLoS ONE 4(5): e5614. doi:10.1371/journal.pone.0005614. Text Citation: Mehling W. 2016 Differentiating attention styles and regulatory aspects of self-reported interoceptive sensibility. Phil. Trans. R. Soc. B 371: 20160013. http://dx.doi.org/10.1098/rstb.2016.0013. The internal consistencies in initial psychometric testing for the English MAIA ranged from 0.66-0.82 with 5 of the 8 subscales showing unstandardized alpha’s >0.70. In addition, confirmatory factor analyses resulted in good model fit for the 8 factor model of the scale (CFI=.886) (Mehling et al. PLoS ONE, 2012). The final survey was comprised of the 8 subscales described as follows, including 32 items. The first subscale, “Noticing” is defined as “awareness of uncomfortable, comfortable and neutral body sensations.” It is comprised of 4 items; the scale demonstrates moderate reliability (α = 0.69). Two further subscales “Not-Distracting” (the tendency to ignore or distract oneself from sensations of pain or discomfort) and “Not Worrying” (emotional distress or worry with sensations of pain or discomfort), are both reverse coded measures with 3 items. They demonstrated sub-optimal internal consistency (Not Distracting: Cronbach’s α =0.66; Not Worrying: Cronbach’s α = 0.67) (Mehling et al PLoS ONE, 2012.). The remaining 5 subscales had good validity. The “Attention Regulation” (ability to sustain and control attention to body sensations ) subscale consists of 7 items, and demonstrated Cronbach’s α of 0.87. The “Body Listening” subscale is a 3 item scale defined as “actively listening to one’s body for insight” also had high internal consistency (Cronbach’s α =0.83). The “Self-Regulation” subscale (which assesses one’s ability to regulate distress by attention to body sensations), and “Emotional Awareness” subscale (defined as “awareness of the connection between bodily sensations and emotional states”) both had high internal consistency (Cronbach’s α =0.82), the former consisting of a 4 item scale and the latter 5 items. Lastly, the “trusting” sub-scale evaluated a participant’s perception of their bodies as safe and trustworthy. Consisting of 3-items, this sub-scale demonstrated good internal consistency (Cronbach’s α =0.79)(Mehling et al PLoS ONE, 2012). Personal communication with the primary author (Mehling) in 2017 indicated that a second version of the MAIA is currently under development in order to improve validity and reliability. Concerning convergent and discriminant validity, the MAIA subscales were evaluated in conjunction with the Five Facet Mindfulness Questionnaire (FFMQ), the Private Body Consciousness Scale (PBCS), the Body Responsiveness Questionnaire (BRQ), Anxiety and Sensitivity Index-Physical Concern (ASI-PC), Pain and Catastrophizing Scale (PCS), Trait Anxiety Inventory (TAI), Scale of Body Connection specifically body disassociation (SBC-BD), Emotional Approach Coping Scales (EACS), and the Difficulty in Emotional Regulation Scale (DERS). Each of the MAIA sub-scales was evaluated for convergent and discriminant validity in conjunction with each of these measures. We refer readers to Mehling et al. PLoS ONE 2012 citation for detailed information. Overall, results indicated that the FFMQ “Observation” subscale was highly and positively correlated with the MAIA subscales "Noticing", "Attention Regulation", "Emotional Awareness", "Self-Regulation", "Body Listening" and "Trusting", demonstrating correlation coefficients >0.40 (p<.0001). Furthermore, the Body Responsiveness Questionnaire "Listening" subscale was correlated with the same 6 MAIA sub-scales described above (p<.0001). This makes intuitive sense considering the MAIA was developed to differentiate between positive and negative forms of interoceptive awareness, and that these scales (FFMQ, BRQ) also evaluate awareness and responsiveness to bodily sensations, respectively. Concerning discriminant validity specifically as it relates to anxiety and distress in response to bodily sensations and pain, measured using Trait Anxiety Inventory, the results indicated that the MAIA subscales of trusting, not-worrying and self-regulation were all significantly negatively correlated with correlation coefficients >0.40 (p<.0001). The results support the ability of the MAIA to delineate between positive and negative attention styles towards the interoceptive experience. For example, one would expect that an individual who has high levels of anxiety would report an inverse relationship between anxiety levels and their ability to respond in a positive manner toward difficult body sensations (Mehling et al. PLoS ONE, 2012). For information regarding internationally validated versions please refer to Mehling et al Phil Trans R Soc, 2016 the following webpage: http://www.osher.ucsf. edu/maia/. Text Citation: Mehling, W. E., Price, C., Daubenmier, J. J., Acree, M., Bartmess, E., & Stewart, A. (2012). The Multidimensional Assessment of Interoceptive Awareness (MAIA). PLoS ONE, 7(11), e48230. http://doi.org/10.1371/journal.pone.0048230. Text Citation: Chinese MAIA: Lin, F., Hsu, C., Mehling, W., & Yeh, M. (2017). Translation and psychometric testing of the chinese version of the multidimensional assessment of interoceptive awareness. Journal of Nursing Research, 25(1), 76-84. doi:10.1097/jnr.0000000000000182. Text Citation: German MAIA: Bornemann, B., Herbert, B. M., Mehling, W. E., & Singer, T. (2015). Differential changes in self-reported aspects of interoceptive awareness through 3 months of contemplative training. Frontiers in Psychology, 5 doi:10.3389/fpsyg.2014.01504. Text Citation: Italian MAIA: Calì, G., Ambrosini, E., Picconi, L., Mehling, W. E., & Committeri, G. (2015). Investigating the relationship between interoceptive accuracy, interoceptive awareness, and emotional susceptibility. Frontiers in Psychology, 6, 1202. doi:10.3389/fpsyg.2015.01202. Text Citation: Lithuanian MAIA: Valenzuela-Moguillansky, C., & Reyes-Reyes, A. (2015). Psychometric properties of the multidimensional assessment of interoceptive awareness (MAIA) in a Chilean population. Frontiers in Psychology, 6, 120. http://doi.org/10.3389/fpsyg.2015.00120. Text Citation: Polish MAIA: Brytek-Matera, A., & Kozieł, A. (2015). The body self-awareness among women practicing fitness: A preliminary study. Polish Psychological Bulletin, 46(1), 104-111. doi:10.1515/ppb-2015-0014. Text Citation: Spanish MAIA: Valenzuela-Moguillansky, C., & Reyes-Reyes, A. (2015). Psychometric properties of the multidimensional assessment of interoceptive awareness (MAIA) in a Chilean population. Frontiers in Psychology, 6, 120. http://doi.org/10.3389/fpsyg.2015.00120. The MAIA has been employed amongst a variety of populations. The initial validation study consisted of 325 participants with a mean age of 48 years old. Most were female (79%), Caucasian (85%), and well educated (over 50% completing graduate school). Over half demonstrated extensive mindfulness practice (>10 years) with the most practiced exercises including meditation (37%) and yoga Tai Chi (32%) (Mehling et al. PLoS ONE, 2012). Since then researchers have tested the scale among healthy volunteer populations, within clinical samples as well as international samples and continue to evaluate graduate and undergraduate student populations. For more information, please refer to citation below. The MAIA has been evaluated in conjunction with multiple mindfulness-based interventions including Mindfulness Based Stress Reduction (MBSR), Mindfulness Based Cognitive Therapy (MBCT), and Mindfulness-Based Childbirth and Parenting. A recent longitudinal randomized controlled trial investigated effects of MBCT versus control (treatment as usual) on the MAIA in participants with chronic pain and comorbid depression (Dejong et al. Front Psychol, 2016). Results showed significant effects for several MAIA subscales including attention regulation (F(1, 24) = 5.34, p = 0.030), emotional awareness (F(1, 24) = 4.63, p = 0.042), self-regulation (F(1, 24) = 5.93, p = 0.023) and not distracting (F(1, 24) = 4.87, p = 0.037). It is interesting that two MAIA subscales which have not been successfully influenced to date are also among the subscales with relatively lower internal consistency, specifically the “Noticing” and “Not Worrying” subscales. The MAIA scale has also been influenced by trainings in various mindful practices including body scan and breath meditations, yogic practices, tai-chi inspired running and Integrative Exercise (aerobic/resistance training merged with traditional mindfulness/yogic practices) (Mehling et al. Phil Trans R Soc, 2016). In a three month randomized control trial investigating effects of mindfulness training on interoceptive awareness, participants were trained in body scanning techniques, traditional sitting meditation, and yogic exercises. At 3 month follow up, several MAIA subscales demonstrated significant improvement in intervention versus control conditions specifically within attention regulation (F(1, 226)= 42.65, p< 0.001), emotional awareness (F(1, 226)= 4.34, p= 0.04), body listening (F(1, 226)= 35.56, p< 0.001), self-regulation (F(1, 226)= 53.61, p< 0.001) and body trusting (F(1, 226)= 14.90, p< 0.001) (Bornemann et al. Frontiers Psychol, 2014). In addition, interventions investigating effects of mindfulness trainings on physiological outcomes showed promise in increasing interoceptive awareness, as measured by the MAIA. 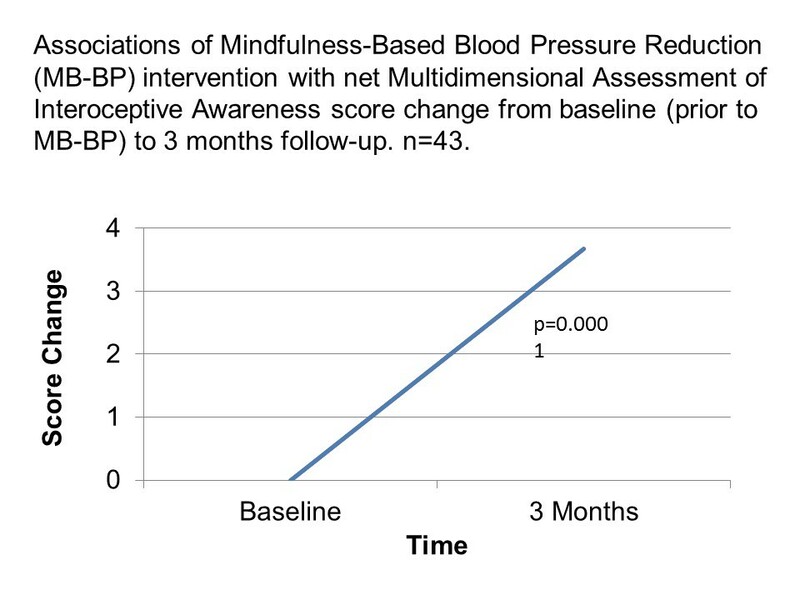 The Mindfulness-Based Blood Pressure Reduction (MB-BP) Study single arm clinical trial at Brown University presented preliminary findings at the International Symposium for Contemplative Studies (San Diego, Nov. 10-13, 2016), demonstrating significant improvements in the overall MAIA score post- versus pre-MB-BP intervention (ClinicalTrials.gov registration #NCT02702258; figure shown below). To our knowledge, as of July 2017, there is almost no research evaluating whether changes in MAIA scores are associated with health behavior change (e.g. diet, physical activity, smoking, medication adherence, etc.). However, several studies demonstrated that increases in the MAIA are inversely related to mental health outcomes (e.g. anxiety and depression). The previously cited MB-BP study (see “Influenced” subsection above) is investigating the MAIA in conjunction with health behaviors associated with cardiovascular disease risk reduction, such as physical activity and dietary behavior change. In addition, research suggests that interoceptive awareness is decreased in participants with anorexic nervosa compared with healthy controls, as measured by both the MAIA and the Heartbeat Detection Task (Pollatos et al. Eating Behaviors, 2008).